Usually I make tacos every single Thursday (and probably still will this week) but I needed to have something a bit outside of that this week. These little cups are a bundle of happiness once it hits your mouth! The only problem is that I ran out of tortilla shells and couldn’t make more! I ended up with half of the chicken mixture and no shells to use. I was smart though and bought some pulled (pre made) chicken for those that dislike beans in our house! So the girls ate this and the boys ate the other stuff!! These are super easy to make. I did have some troubles getting the tortilla in the muffin pan so I did warm mine up first so that it didn’t break apart. I was afraid to push them in the pan so they were a better shape, but either way, they still taste really good. Preheat the oven to 425 degrees. Coat a muffin tray with cooking spray. Chop up the chicken then combine it with the beans mozzarella cheese, most of the white onion, most of the cilantro, juice from 1/2 a lime, the sour cream, and the salsa. Mix until evenly combined, taste then season with sea salt and freshly cracked pepper, to taste. Using a biscuit cutter (or a ramekin & a knife) to cut out small circles from the large flour tortillas. Carefully place the flour tortilla circles into the muffin tray. Add a spoonful of refried beans into each cup followed by a bigger spoonful of the chicken mixture. Top each cup with a small about of cheddar cheese. (I used mozzarella cheese – had the cheddar out, but decided to go with mozzarella). Place into the oven and bake for 15-20 minutes, or until heated through and the tortillas are crisp. Garnish the top with sour cream, avocado, tomato, green onion, and cilantro. Serve with salsa if desired. Next time I make this I will make sure to have more shells on hand! These were really good. Really good. Add whatever your choice of topping is…you can’t go wrong with what you put on these. I was never too excited about mexican cuisine until Patricia and I got to know each other. She LOVES it, and so she made me try some things I may have avoided otherwise. Thanks for that Patricia! Now it’s one of my favorites. I still can’t eat it as spicy as she does, but I’m miles ahead of where I was! When I read on Saturday that Cat Cora would be making Chile Lime Flank Steak Tacos with Pineapple Salsa, I thought… hmm, that’s not something I’d normally put together. Since I’ve been shown before I can like things I wouldn’t expect, I was game to give this a try. I was very pleasantly surprised at how great these were. The heat of the chiles is toned down by the sweetness of the pineapple and red onions. So even a spice wimp like me can handle the little bit of jalepeno in the salsa. I’m not usually a fan of cilantro, but I did use it here. It is not overpowering as it can be in some salsas. 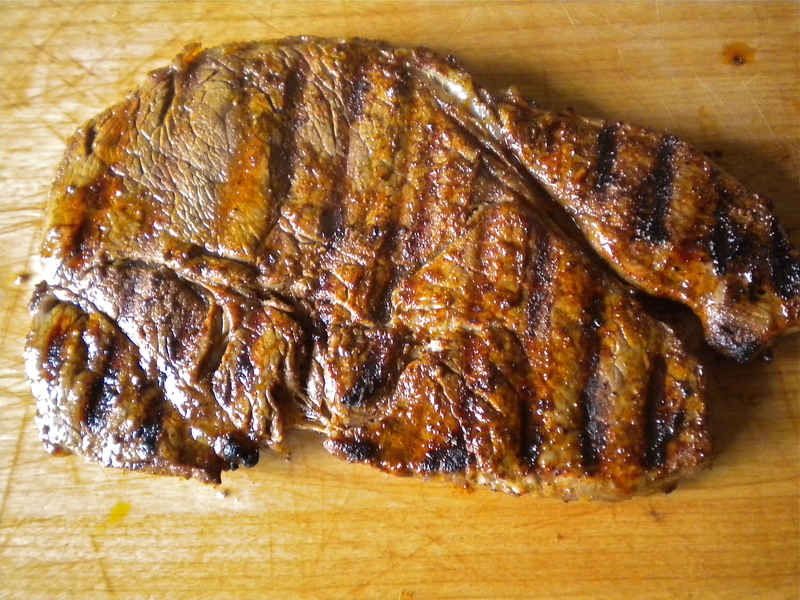 The steak is so tender and juicy, I may use the marinade even if I’m not making tacos! Mix spices, salt, pepper, lime juice and oil in a small bowl. 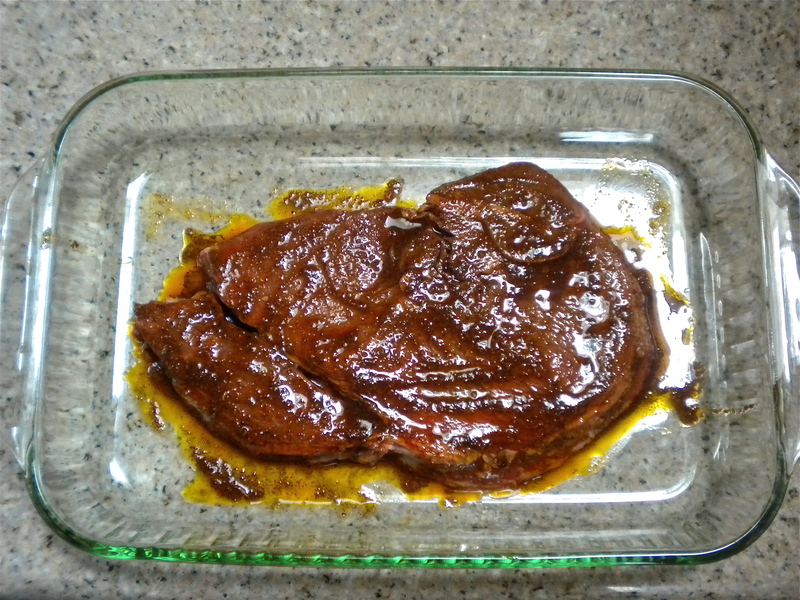 Place the steak in a shallow dish and rub the paste evenly over both sides. Cover and let marinate for 1-4 hours. Preheat grill to medium-high. Slice off leafy top of the pineapple and just enough of the bottom so the fruit rests flat on a cutting board. Slice off the skin with a sharp knife, cutting from top to bottom and taking off as little of the flesh as possible. Discard the skin. Cut out any “eyes” with a paring knife and discard. Slice the fruit away from the core in 4 or 5 slabs. 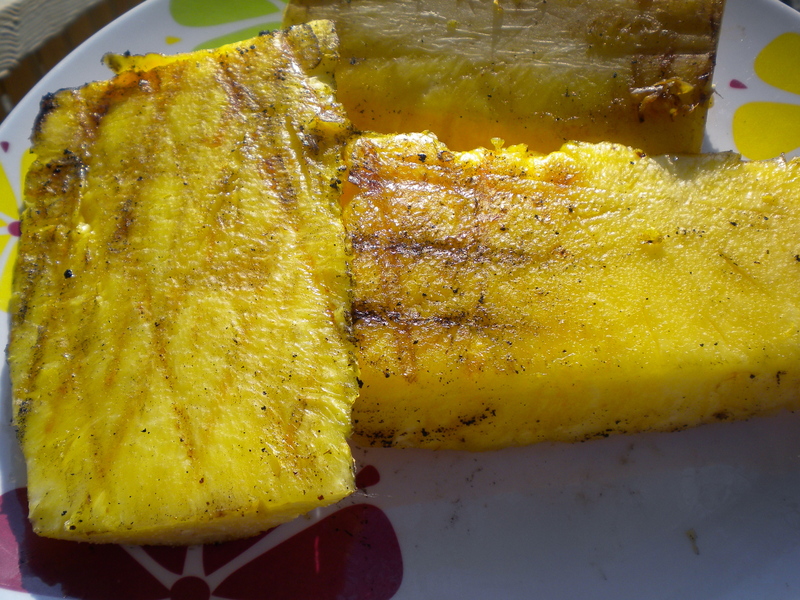 Place the pineapple slabs on the hot grill and grill until the fruit is just beginning to show some browning, 1-2 min per side. Let the pineapple cool for a few minutes, then dice. 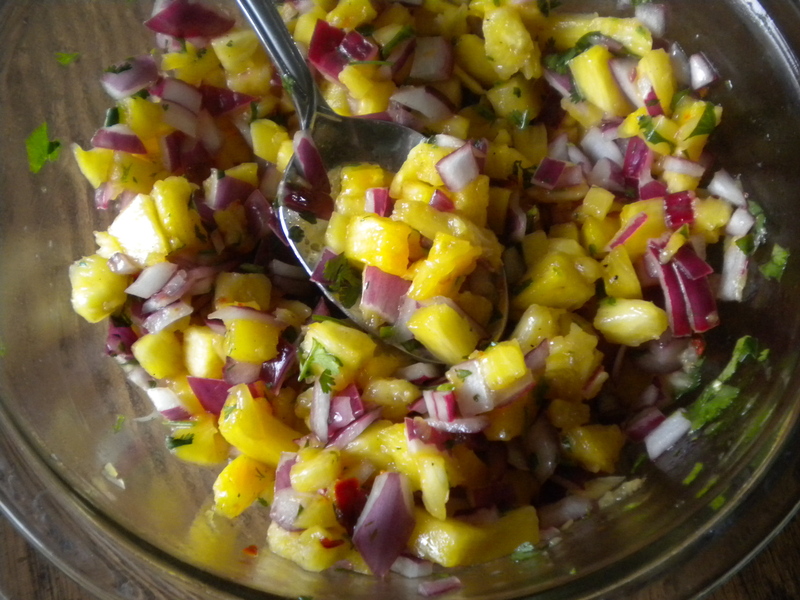 In a medium bowl, mix the diced pineapple, onion, cilantro, lime juice, vinegar, olive oil and jalepeno and blend well. Grill the steak for 5 to 6 minutes on each side (slightly longer for well done meat). Remove from the grill and let rest for 10 minutes before slicing. Cat explained this allows the juices to go back into the meat rather than running out onto the cutting board. Meanwhile, place the tortillas on the hot grill and grill for about 10 seconds on each side, then wrap in a cloth napkin to keep them warm. Slice the steak across the grain into 1/2 inch thick slices and serve with tortillas and salsa. Scott was a bit skeptical too when I told him what I was making, but he’s a great sport. He’ll give whatever I make a try. He loved these tacos! Top 3 in his favorite meals he decided, so we’ll definitely be making these again soon.